For spaces that move like RVs, buses, vans, and tiny houses on wheels, it's a good idea to make your chimney detachable. 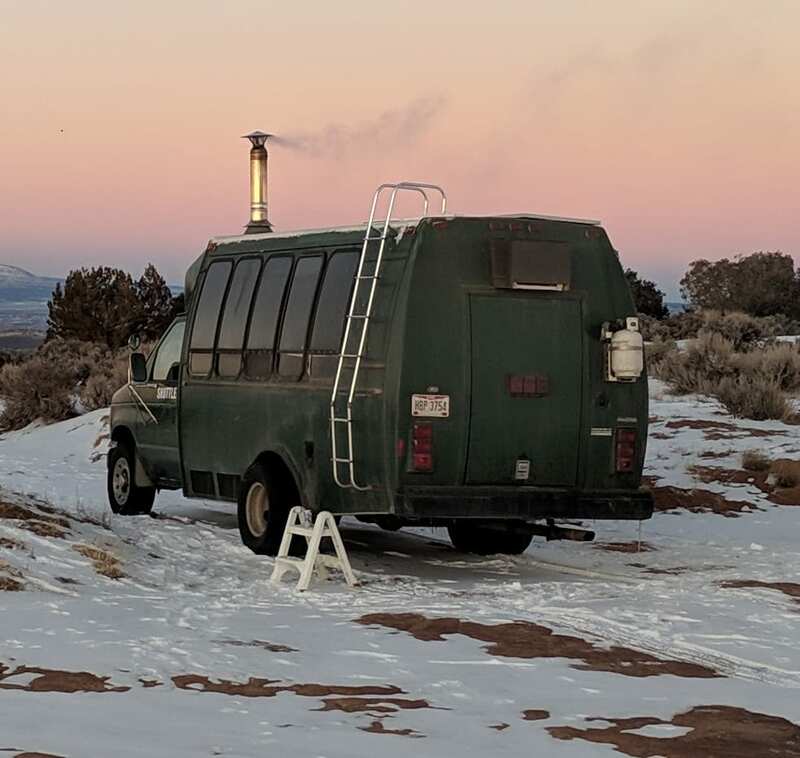 A detachable chimney will help you get the height you need above your roof without having to drive around with a three foot pipe sticking out of your rig. A detachable chimney can also be a big help for stealth vans when you don't want to be noticed, or for a tiny house on wheels that is close to the maximum legal height to tow. Can't I just make my chimney shorter? Some people do get away with stubby chimneys, especially on taller mobile structures with relatively flat roofs like buses. When we ask why, they usually tell us they think it would be a hassle to climb onto the roof to deploy the chimney. We don't think it's a big deal, but you might feel differently. 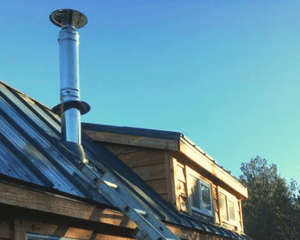 Residential code requires the chimney opening to be 3' above the roof line, or 2' above any part of the structure within 10', whichever is higher. We've seen quite a few chimneys "in the wild" that are breaking this rule and seem to work OK, but there's a few reasons why sufficient height is safer and more reliable. The rising hot gases in your chimney are the "engine" of your wood stove. A taller chimney means a stronger draft. If the overall height of your chimney is too short, your stove won't draft well, and might spill combustion gases into your living space. 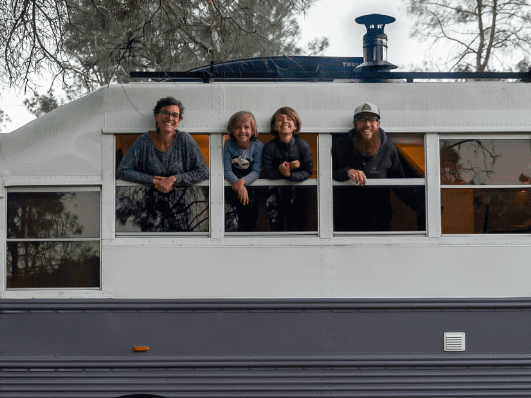 This is an especially big deal at higher elevation where the air is thinner, and for shorter structures like RVs and Vans, which already have very limited height to work with. In windy conditions, the roof of your structure can create turbulence that can push air downward into your chimney, causing combustion gases to spill into the living space. Having the chimney a couple of feet above the highest part of the structure helps to keep the chimney opening above any turbulence created by the structure. If your chimney is short enough that the smoke hits your roof, flammable creosote can condense on your roof, which is a fire hazard if it's allowed to accumulate. If there is any part of your structure that is taller than your chimney, the house stack effect can compete with your stove for fresh air. 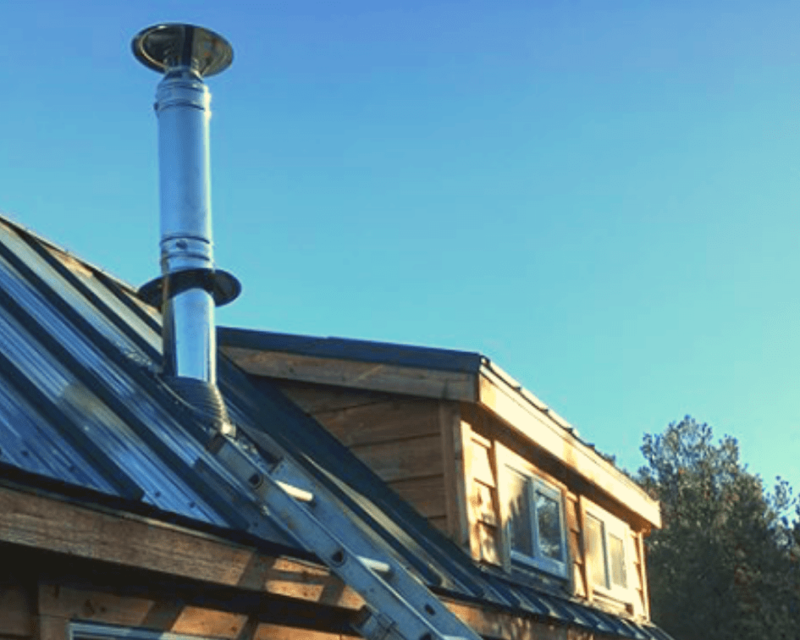 Fortunately, since our stovepipe is modular, it's very simple to build a detachable chimney using Tiny Wood Stove's chimney components. For a vehicle like an RV, bus, or van, we suggest using the RV/Bus Roof Exit kit, which comes with a 20" section of insulated pipe. Order an extra 20" of insulated pipe, an extra double-wall clamp, and a driving cap to make your detachable chimney above the roof. Use one section of insulated pipe to go through the roof, leaving just enough pipe above the pipe boot to clamp the next piece on. Typically, that puts the chimney stub at about 9-10" above your roof line. When you're ready to use the stove, deploy the extra 20" section with the roof vent attached. When you're packing up to drive away, take the detachable chimney down and replace it with a driving cap. For a tiny house on wheels (THOW), we suggest using the Tiny House Roof Exit Kit, and whatever extra insulated pipe you'll need to get enough height above your roof line to follow the 3-2-10 rule. Any joint above the roof line can easily be removed by disconnecting the clamp, removing any parts above that joint, and capping with a driving cap. If your THOW is at or near the height limit for highway travel, you may want to position your chimney closer to the low side of your roof, so that the 9-10" required for the chimney stub will not put you over the height limit. If your stove is directly under the highest part of your structure, you maybe able to use two 45 degree elbows to offset your chimney from your stove. If you must put your chimney on the high side, you may be able to use a wall exit to keep all the permanent chimney parts below your roof line. If you're using a wall exit, you can detach any exposed joint on the outside of your structure and replace it with a driving cap. You may need to disconnect your wall support bracket to remove the detached portion. If you need to remove the chimney from your THOW to get under the highway limit for width, it's possible to remove the entire exterior chimney from a wall exit. But it's a little more involved than a normal detachable chimney. You'll need to break the silicone sealant that seals the horizontal pipe through the thimble. Once you get to your destination and reassemble your chimney, you'll need to re-apply the silicone. Once you've removed the insulated pipe from the thimble, you're going to have a big hole in the side of your house that you may want to find a way to cover while traveling. Removing a wall exit entirely may be a good option for a THOW that only moves a few times in its life, but it's probably not a good plan for an RV or a bus. Every joint in your flue system needs to be secured with either a clamp, or three stovepipe screws through the perimeter of the joint. Both methods are acceptable. We prefer clamps for everything above the roof line because screws can provide a point of entry for rain water, and clamps don't. For any joints that are repeatedly removed and replaced (as is done with detachable chimneys), clamps are preferable. Screw holes will wear out relatively quickly, while clamps tend to last much longer with proper care. For longer life on your regularly used clamps, we recommend applying a heat safe lubricant like spray graphite to the moving parts to prevent binding.